The 1978 Atlanta Braves might have done pretty well in a baseball skills competition, certainly better than they fared in the realm of baseball itself. They had in Phil Niekro the surefire winner of the knuckleball throwing contest, which I picture to be something along the lines of figure skating or diving in that it would have judges weighing in on the performance, in this case specifically on the relative proximity of the competitors’ absurd offerings to the flight of a butterfly. They had a catcher in Biff Pocoroba with a great throwing arm. They had in Jeff Burroughs a guy who could hold his own in a home run derby. They had in young Dale Murphy a Bruce Jenneresque athletic specimen capable of vying for wins in various leaping and sprinting and hurling competitions. And they had perhaps the league’s best collection of sacrifice bunters, boasting not only a roster clogged with utility infielders whose ever-tentative professional survival depended on being able to do “the little things” but more specifically featuring three men who had already or would soon lead the league in sacrifice bunts: Phil Niekro (1968), Glenn Hubbard (1982), and Rod Gilbreath (1976). Baseball itself was really too brutish and crude for the 1978 Atlanta Braves. If only wins and losses had been based in part on how often one of their batters could, with the precision of a master craftsman, use their deadened bat to guide a pitched ball into a small circle near home plate, they might not have been almost instantaneously forgotten. But baseball is not a skills competition but an arena wherein might makes right, more or less. The team of bunters and competent double-play turners saw their season in microcosm on its last day, when George Foster, arguably the league’s strongest man, homered twice, once in the fourteenth inning, to help the Reds overpower the Braves. Awareness of that final game of 1978 may have grown recently, for it was the last game in which Sparky Anderson, who died last Thursday, managed the Big Red Machine. I don’t know if Anderson knew that the writing was on the wall as he managed that game. It would be only a few weeks until he was fired, a decision that seems in retrospect both unfair and moronic. In Anderson’s nine-year tenure the team had won two World Series titles, four pennants, and five division titles, and even in the two most recent “down” years of 1977 and 1978 he’d led the team to 88 and 92 wins, respectively. Also, not only did Anderson go on to lead the Detroit Tigers back into contention and, eventually, to the 1984 World Series title, Anderson’s replacement on the Reds was John McNamara, whose managerial career would have proven to be quietly mediocre—as evidenced by his .485 lifetime winning percentage—had he not capped it with a spectacularly bad performance steering the Red Sox toward ruin in the 1986 World Series. Replacing Anderson with McNamara was, as decisions go, like moving from a sturdy mansion to a hut made of duct tape and straw. But I guess at the time it made sense, which suggests that the decision might have been lurking in the autumn air by the time Sparky managed his last game in a Reds uniform. As already mentioned, the sheer power of the Reds, in the person of their top slugger George Foster, would eventually overwhelm the Braves and send Sparky out on a winning note, but for some time the outcome of the game was in question. In the twelfth, the Braves threatened, though “threatened” may be too strong a word to use given the batters that would be called upon to drive in the go-ahead run. In the twelfth, the Braves kind of waved a wooden spoon around in a vaguely menacing way that probably didn’t scare anybody too much, metaphorically speaking. Speaking more literally, they got a man aboard when Bruce Benedict singled. Sparky’s counterpart and fellow future managerial immortal in the Braves’ dugout, Bobby Cox, elected to insert a pinch-runner for the slow-footed catcher, and Rod Gilbreath entered a major league baseball game for the last time. Rod Gilbreath had entered the league as a teenager and had played parts of several seasons for the Braves, filling in at second or third, never really catching on as a regular (though, as mentioned, he won the league’s 1976 sacrifice bunting crown, a gaudily bejeweled piece of honorary headgear, at least in my imagination). 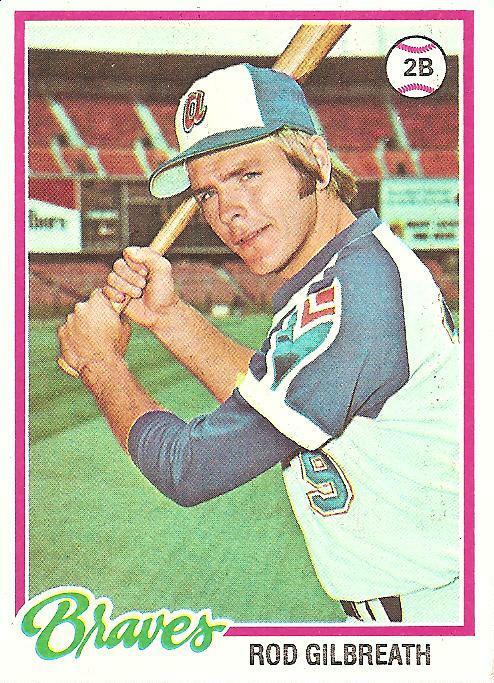 The 1978 season had been a typical one for him, his average of .245 for the season a shade below his lifetime .249 mark, but perhaps because he was now 25 and no longer quite young enough to show any signs of ever blossoming into something more, and perhaps also because the Braves had other younger players, namely Glenn Hubbard and Bob Horner, who looked ready to become regulars at second and third, and perhaps finally because the 1978 Atlanta Braves were clogged with utility guys like Rod Gilbreath, players who in certain situations and on certain teams would have been useful, even vital, but who because of their great numbers on the Braves combined to turn their individual utility into collective uselessness, prompting the Braves to try something, anything, else. Anyway, one way or another, they gave Rod Gilbreath the heave ho after the 1978 season. He would sign with the Pirates but never make it back to the big leagues. This pinch-running appearance on October 1, 1978, with Sparky Anderson looking on from the opposing dugout, would be Rod Gilbreath’s faint, inconsequential, instantly forgettable swan song. Gilbreath moved to second on a one-out walk to fellow utility man Jerry Royster. There he would be stranded. First light-hitting Eddie Miller (sporting a .143 batting average) flied out to left, and then one of the youngsters crowding Gilbreath to the sidelines, Glenn Hubbard, fanned. Young, raw Dale Murphy put on the catching gear and took over Gilbreath’s spot in the lineup, and it was over. Whatever would happen beyond that point would not include the 1976 National League Bunt King. Please keep the thoughts coming on the What Are the Greatest Cards of All Time post. Eventually, I’ll try to pull together a post showing the “finalists,” i.e., cards that have gotten multiple mentions in the comments section. You are currently browsing the archives for the Rod Gilbreath category.